As homeowners we tend not to think about our home's gutters until there's a problem. Over time, water runoff from your roof can damage wood trim, cause basement leaks and lead to mold growth. Whether you have a problem with your current gutters or you're just looking to upgrade your home's exterior, custom-installed gutters from Larson Home Services might be the solution for you. Seamless aluminum gutters can help you avoid the expense and hassle of water damage. During your in-home consultation, we'll go over all the benefits of our gutter products and help you find a solution to fit your home and budget. Contact us today to get a free estimate for gutter installation in Greater Madison! This home has so many unique aspects that the homeowners didn't want to go with just any plain gutters. They loved the look and function of our gutter system and love that the lifetime warranty will transfer to the next homeowner. Glad we could help! LeafGuard is just what this garage needed. It looks great and will keep it maintenance free. Installing the LeafGuard Gutter System on your hard to reach second story is a great idea of course. However, even on one story homes it not only can help you eliminate cleaning out the gutters it can also add to the beauty of your home. Check out how great the LeafGuard Gutter system looks on this ranch style home in Sun Prairie. Great work Derek & Drew! This adorable home in Stoughton got its LeafGuard Gutters installed just in time as all of the green began to grow in their backyard. Adding a LeafGuard Gutter System to their home not only adds to the look of their home but also keeps them off the ladder. The best thing about LeafGuard is it's guaranteed for life no matter who owns the home. This home in McFarland stands tall above the street and makes the gutter cleaning even more difficult. So glad we could help these homeowners never worry about gutter maintenance again. Especially that third level. Looks great! More time to enjoy Lake Waubesa for these homeowners now that they have our worry free LeafGuard Gutter System. Climbing up the ladder to clean out gutters multiple times per year can be such a dangerous job. With their new LeafGuard Gutter System installed by Tyler and Brad these homeowner's no longer have to worry about that horrible chore. They can now enjoy the benefits of those big beautiful trees without thinking about all of the leaves and debris that come with them. This home in Madison needed an update when it came to the gutters. We went above and beyond by also updating the soffits and fascia. The homeowner was delighted that we could help him with improving his home. What a great look! This home owner was having trouble with gutter maintenance. LeafGuard provides worry free gutters that help homes of all sizes. This Madison homeowner is looking forward to never having to worry about gutter maintenance again! Aluminum gutter systems installed by licensed professionals. If you notice any gutter problems, it's best to let an expert inspect your home for further damage. 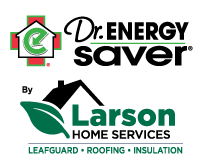 Larson Home Services will send a highly-trained professional to inspect your gutters and provide you with a free estimate to replace your gutters with a quality solution that comes with a lifetime guarantee. During your consultation, we will inspect your home to pinpoint any gutter problems. Then we'll show you how the LeafGuard gutter system works, take measurements of the area where your new seamless gutter system will be installed and give you a written estimate for the cost of your gutter installation project. When your gutter installation is complete, your gutter installer will followup with a telephone call or a visit to your home. Investing in proper rain gutter installation can improve your home’s value and curb appeal and prevent costly repairs. Make cleaning gutters a thing of the past and choose proven gutter products and installation from Larson Home Services. We're your expert gutter contractor in Janesville, Sun Prairie, Middleton and surrounding areas. Contact us today to request your no-obligation consultation and free gutter installation estimate in Wisconsin.